A Canadian beachcomber made an unexpected find along British Columbia's Pacific Coast on April 18. Debris from Japan's tragic tsunami a year ago have only recently begun washing up on North America's west coast. Like on April 18th, when Peter Mark found a white container with a Harley Davidson inside of it. The now rusted and seaweed caked boulevard cruiser sported license tags from Miyagi Prefecture, one of the areas most ravaged by the tsunami. Mark, who was riding his ATV on a remote stretch of beach on Graham Island off the coast of British Columbia, spotted the large white box laying in the sand. It was damaged, but still contained the motorcycle, some golf clubs, a few tools and camping gear. Based on video footage of tsunami wrecked Japanese moving vans, the box looks like it was part of one of the vans. The National Oceanic and Atmospheric Administration said that the Japanese government estimated that 25 million tons of rubble were generated by the tsunami, but so far, no one knows how much of it was swept into the ocean. Shortly after the disaster, satellite imagery picked up large patches of floating debris off Japan's coast, but the patches have since been broken up by wind and ocean currents. NOAA scientists expect much of the flotsam to make its way to the Hawaiian Islands and North America's Pacific Coast via the Kuroshio Current. From there it will augment the Pacific Ocean's already significant marine debris patches. Statements made by various authorities suggest that it would be nearly impossible to clean it all up. The Harley Mark stumbled upon is the first large piece of tsunami wreckage to wash up on a beach on the other side of the Pacific. Until now, bottles and other small buoyant items are all that have made landfall. 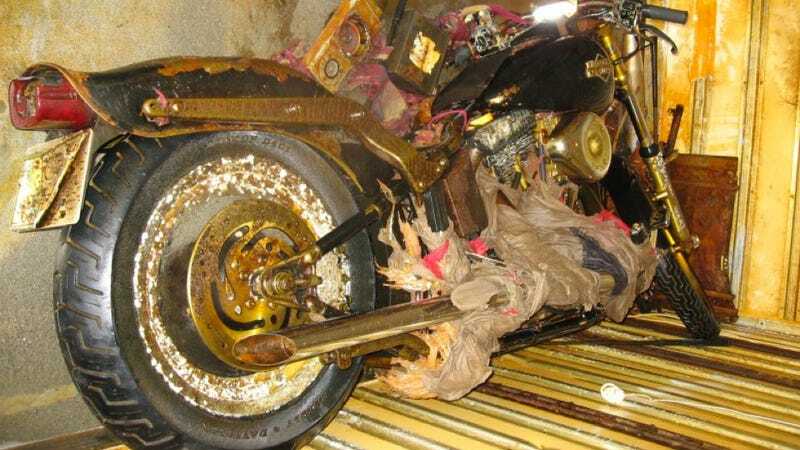 Japanese officials — who said that most possessions similar to the found motorcycle would have sunk already — are searching for the bike's owner to see if that person is still alive. "In many cases, I believe the original owners will welcome reuniting with their lost objects," said Hideki Ito, Japan's consul general in Vancouver, to CBC News.